Nobuhiko Obayashi’s dream project finally comes to the big screen as a film only the master could have made. A one of a kind cinematic work it’s a must see for anyone who love film and what it can do. 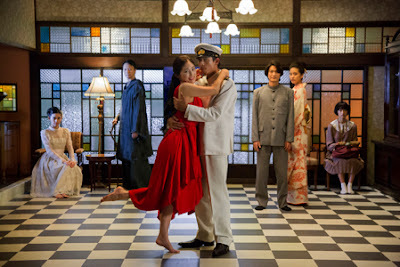 Based on the novella by Kazuo Dan the film tells the story of a group of friends in 1937 and on the eve of what would become the Second World War. The teens (played by adults) know what is coming and they want to live life to its fullest. A dream like memory play this is a film that is very much the work of Obayashi with charged dialog and magical imagery. It is a film that delights the senses with its expressive use of film/digital technology to tell its story and make us feel something by putting us in the halcyon days of old. I am in love with the look and feel of the film. This is a movie that really is a movie. As much as I am in love with the film technically and physically I am not quite as in love with film as a whole. For whatever reason the film never fully came together for me. part of it was I was always aware of the technical wizardry going on screen so I never disappeared into the film. Similarly some of the mannered dialog and takes kept me distanced. While I was enjoying the hell out of it I wasn’t connected. As a result there were times I felt the 169 minutes passing. My reservations aside I highly recommend this for anyone who loves the director or just one of kind films. Hanagatami closes out this year’s Japan Cut. For more information and tickets go here.